The Gordon Gastil Scholarship was established in 1995 following Gordon’s retirement as Professor of Geological Sciences at San Diego State University. Gordon was born and raised in San Diego and enrolled at San Diego State Teachers College where he came under the influence of Baylor Brooks. At the time, no geology degree was offered at SDSU so Baylor directed Gordon to the UC Berkeley where he completed his BSc and PhD in geology. 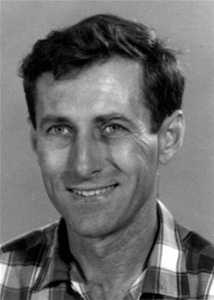 Following work for Shell Oil Company, service in the U.S. Army, and mining exploration in Canada, Gordon joined San Diego State as a full-time faculty member in 1959. Together with students and colleagues Gordon went on to map thousands of square kilometers in Arizona, California, and Mexico, including the entire state of Baja California Norte! Gordon was able to accomplish his own teaching, research and mapping interests, while at the same time providing students with abundant opportunities for hands-on-learning by encouraging participation in field, laboratory, and library research activities; many of these joint efforts and projects lead to co-authored publications — a real coup for aspiring young geologists. Gordon was awarded the prestigious Dibblee Medal on August 21, 2002 in recognition of his extraordinary accomplishments in field geology and geologic mapping. Although well known for his south-of-the-border mapping efforts in Baja California, Gordon’s broad range of interests and remarkable ability to break new ground across scientific disciplines is truly the hallmark of his rich scientific research career. He freely shared his enthusiasm and ideas with students, colleagues, and anyone else interested in the Earth and ultimately supervised 58 MSc theses at SDSU along with many dozens of undergraduate research projects. The Gastil Scholarship is awarded to students displaying distinction in field geology.